The Ampper Premium Trunk Organizer is an effective way to keep groceries, sporting equipment and emergency road items together for families on the go. 1, Large Capacity – Holds up to 65lbs. 2, Stiff base plates provide bottom support. 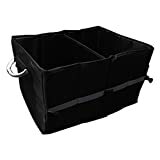 3, Sturdy side walls and center divider hold organizer open as you load items. 4, Comfortable handles with grips allow effortless handling. 5, Strong 600D polyester fabric withstands wear and tear of vehicle use. 6, Innovative Design Enables Storage of Various Sized Items. 7, Middle set of buckles permits folding to half-length for smaller jobs. 8, Collapses for efficient storage when not in use. Heavy duty: unbreakable handles, sturdy plates on bottom, hardy sides, fortified stitching, quality 600 D polyester fabric. Portable & Convenient: maximum comfort size for carry items after Wal-Mart shopping; 2 large space for you to storage scattered items, strong side-pockets for smaller items. Collapsible & Compact: unfold size 17.3 x 12.6 x 11.8 inches, fold size 2.36 X 12.6 X 11.8 inches; easily fold up or unfold with the clip-on straps. Durable & Versatile: premium quality make it durable when you store, organize or carry your items; compatible for all car SUV & truck. 100% SATISFACTION GUARANTEE: no reason for return or change, life time quality warranty. Hassle free 2 years warranty.